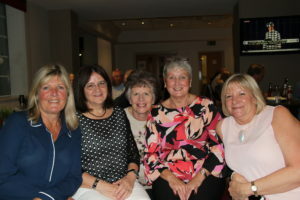 Hopefully this ‘sample’ photograph from the recent Re-Union will whet your appetite to see the website’s full Photo Gallery of what again provided another enjoyable evening of renewing friendships and catching up on past times – particularly as this was a first ‘re-acquaintance’ for several former members who were able to attend this time! Some 28 former Drama Club members attended – including some who only managed to do so after ‘manoeuvring’ their way through a cordon of about 9 Police Cars and their occupants spread out around parts of Chingford Mount Road – but fortunately not directly around the Holiday Express Hotel! By the time this Newsletter reaches you the Website will have been in existence for just on a year and has seen a good deal of memorabilia added over this period – with hopefully more to be discovered in due course! As those former members who attended the Re-Union will already know, this event was also used to kick start a ‘Funding Appeal’ to ensure that the website continues once the initial contract, funded from the CMMF, ‘runs out’ early in the new year. The Re-Union gave the ‘Appeal’ an ideal start and it is good to report that £135 was raised by way of ‘on the night’ donations plus Standing Orders that have been set up to make an annual donation – which will really be helpful in making sure that we can, as we hope, keep the website going for at least a few years more! Thank-you very much – This is appreciated! A copy of the Funding Appeal Leaflet is enclosed with this Newsletter, primarily for those who were not able to attend the Re-Union, with the hope that other former members might similarly consider helping to keep the website continue in the foreseeable future. Details of the website costs and contact arrangements for making a donation, or a small annual Standing Order, are given within the Appeal Leaflet.